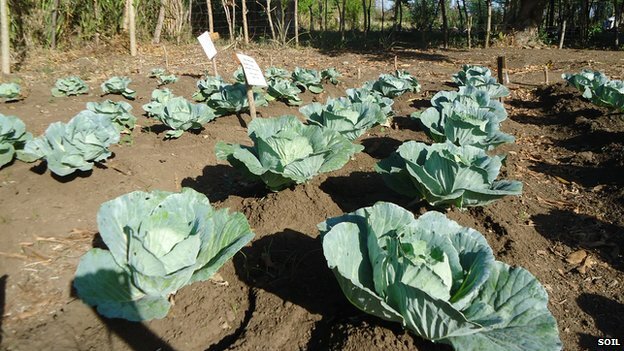 Human excrement spread by poor sanitation was to blame for over 9,000 cholera deaths in Haiti, but now, thanks to a simple measure to transform it into nutrient-rich compost, cleanliness has improved – and some enterprising Haitians are able to grow their own fresh food. Like an oasis in the middle of the desert, Frantz Francois’ garden is probably the greenest area in Cite Soleil, the biggest slum in Haiti, the poorest country in the Americas. In an area where it is hard to find even a tree, Francois grows carrots, peppers and callaloo – a leafy vegetable traditionally used for soups – in his garden. But it was not easy for him to tempt his neighbours to eat them, as he uses human waste as a fertiliser – something of a taboo in these parts. “At the beginning some people said they didn’t want to eat food from this garden because it was grown in the soil from the toilets,” says Francois. Things started to change when he got his first harvest. Neighbours saw the vegetables and they spread the word. Little by little, the residents are getting over the taboo. 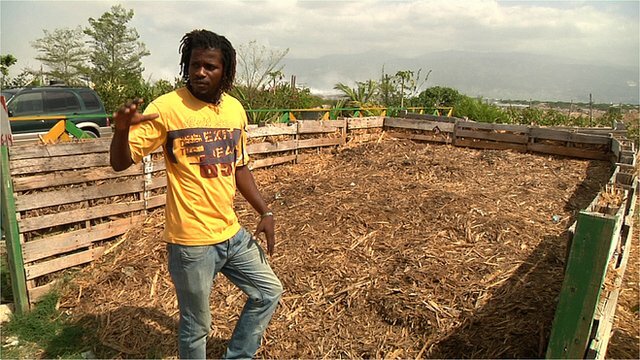 “Now when they see how the plants grow, they realise there’s no contamination and everyone in Cite Soleil would like to have a garden like this for themselves,” he says. 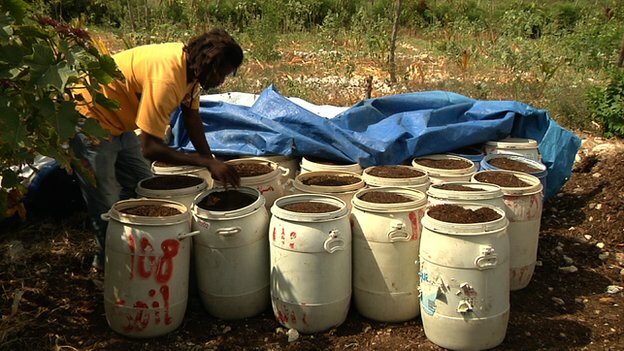 Frantz Francois runs an urban garden that uses compost from eco-friendly toilets, a system promoted by SOIL, an NGO that aims to improve sanitation in Haiti. When SOIL was founded back in 2006, only 4% of the rural population had access to proper toilets. Even in the capital Port-au-Prince it was only slightly higher at 6%, according to SOIL’s co-founder Baudeler Magloire. Many toilets which do exist often flush untreated waste straight into rivers or groundwater. Open defecation in the streets led to the spread of disease. After the devastating 2010 earthquake that killed more than 250,000 people and left 1.5 million living in temporary camps, poor sanitation caused a health crisis. Cholera, a disease transmitted by drinking water or eating food contaminated by the faeces of an infected person, broke out later that year killing more than 9,000 people. Several studies have found that cholera was probably brought to Haiti by UN peacekeepers from Nepal. When cholera struck SOIL had already taken composting toilets to different parts of the country, but the fatal disease proved a setback. At first glance, an eco toilet doesn’t look too different from a portable toilet. The difference is inside. Faeces and urine are collected in separate drums and, after each use, a layer of sawdust-like material made from sugar cane waste and peanut shells is added on top. This reduces the risk of infection and masks unpleasant odours. However, during the cholera outbreak Haitians were told that poor sanitation was to blame, so many people thought collecting human waste added to the problem. As a result, the NGO was asked to leave their neighbourhoods and take their toilets with them. “In Haiti, when you talk to people about sanitation they’re afraid of it,” says Jimmy Louis, Sanitation Coordinator of SOIL. But the organisation decided to face the criticism by raising awareness about sanitation and inviting community leaders to their facilities to see for themselves how the toilets worked. 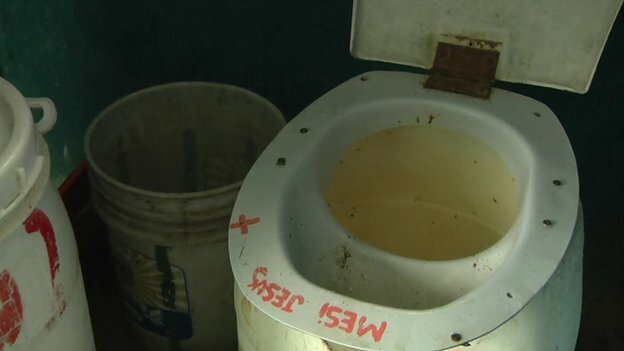 Now, more than 8,000 people have access to these toilets in Haiti, a country of about 10 million people. 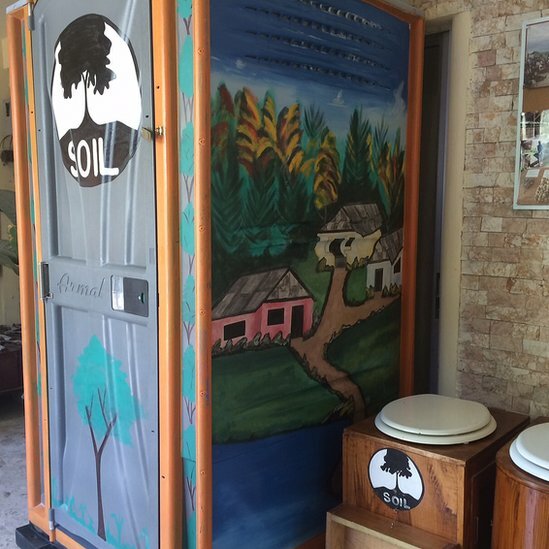 According to Erica Lloyd, SOIL’s Program Manager in Port-au-Prince, most of the users of the eco toilets didn’t have access to toilets before. One of them is Midi Idemon. 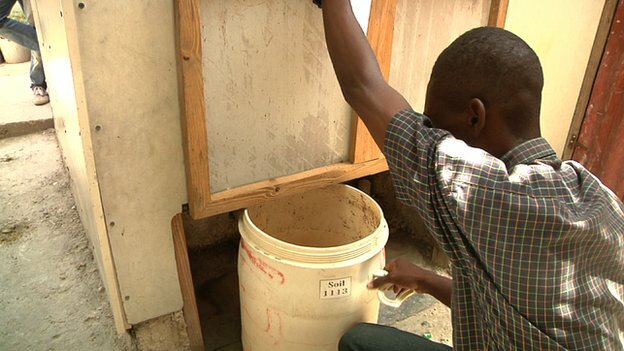 He lives in the Gerald Bataille district in Port-au-Prince, and says the eco toilets dignified his family’s lives. “Before we had these toilets, there was a communal latrine. It wasn’t good because some people didn’t clean it, it smelt bad and there was a high risk of getting diseases. For Paul Christian Namphy, Coordinator for Haiti’s Water and Sanitation Authority DINEPA, ecological sanitation is an important initiative for preventing cholera, offering a lot of promise for the future of Haiti. “Cholera is the disease of the poor, of the disenfranchised, it’s the disease of those that for centuries have not had the minimum of what people need to have a dignified existence. In order to stop the transmission of cholera and other diseases, SOIL collects human waste from the communities four times a month and takes it to a composting site where dangerous bacteria are killed. The compost is left between 8 and 12 months in different piles outdoors at a high temperature (more than 54 degrees Celsius) to kill the most resistant bacteria. It’s a “relative inexpensive” process, as SOIL’s Erica Lloyd puts it, because “Mother Nature does the hard work there”. High temperatures are reached through sun exposure and SOIL only pays for the cleaning supplies. After that time, it becomes a safe compost that can be used as a fertiliser. “It’s like a circle: eat, go to the toilet and then give back to nature. The main idea is to recycle the resources,” says Jimmy Louis. 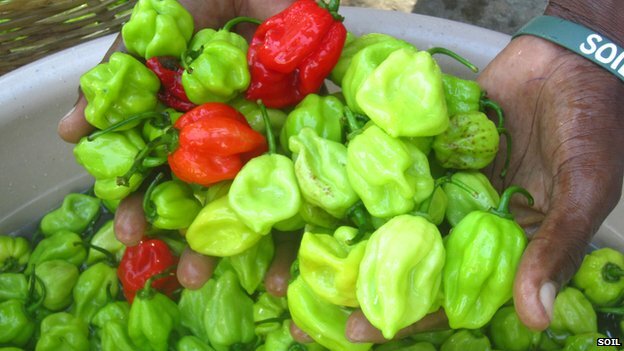 This organic fertiliser, which is sold to local farmers, is already being used in the garden at SOIL’s headquarters to produce different vegetables such as corn, spinach, potatoes, peppers and rice. They’re now testing how the compost works with aubergines and beans. And in a country where, according to the World Food Programme (WFP), nearly a third of the population suffer from food insecurity and 600,000 people need external food assistance to survive, this can help tackle a big problem. This is what Francois is trying to do from his community garden in Cite Soleil, where he teaches children and young people to grow plants in old tires and compost soil.